Sign up for the Newsletter at the bottom of any page! New subscribers will receive a coupon code for 10% off their next order! Eye of Ra Beverages focuses on Full Spectrum Hemp Oil/CBD infused beverages for consumers located across the country. Since we only use hemp stalk derived, nano-infused CBD, it is legal to consume in all 50 states! Ra Beverage is the future of CBD infused beverages! We are proud to introduce Ra Enhance! Ra Enhance is a unique water enhancer that is natural, low calorie, containing high quality nano infused, full spectrum Hemp Oil/CBD, naturally sweetened with stevia extract, naturally preserved with Vitamin C, free of artificial ingredients, gluten free, color free, vegan and non GMO. Each bottle contains 30, 8fl oz. servings (~3.3mg Nano Infused, Full Spectrum Hemp Oil Containing CBD/serving). Just twist off the included dropper top and add to water, it’s that simple. Plain, Mango, Blood Orange, Watermelon and Cucumber Lemonade! What sets our products apart from our competitors? Many nutrients and phytocannabiniods such as Cannabidiol are poorly water soluble, limiting their bioavailability when inside the body. Nano technology enables substances to exist in their smallest particle form improving solubility and ultimately allowing nutrients to reach their desired site in the body. At the nanoscale, substances may have the ability to act in new and powerful ways beyond their usual capacity. RA Enhance uses revolutionary nano-science to deliver naturally occurring hemp derived CBD in smaller, more bioavailable doses for ultimate action. By offering Cannabidiol in the nano form, this nano-amplified botanical constituent is more easily absorbed by the body, can work more efficiently, and can be 10x more effective than traditional delivery methods. This means more of what you are consuming gets used by the body, and doesn’t just pass through your system. Cannabidiol (CBD) is one of at least 85 active cannabinoids identified in hemp. It is a major phytocannabinoid, accounting for up to 40% of the plant's extract. CBD is not psychoactive like THC, and effects the body differently. RA Beverages and its affiliates make no claim to any medical benefits to the use of Cannabidiol Oil or any of its derivatives. With bold, rich flavors and all natural ingredients, RA Beverages strives to bring you the best tasting CBD infused products on the market. With our in house flavor chemists constantly experimenting with new profiles and combinations, you can expect a wide variety of choices in the months to come! 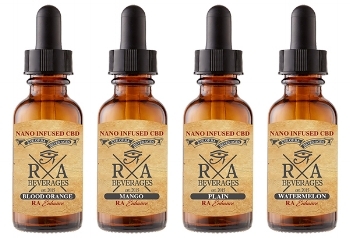 RA Beverages use only the highest quality Nano-Infused, Full spectrum Hemp Oil made exclusively from non-imported, Colorado Grown, Organic hemp.